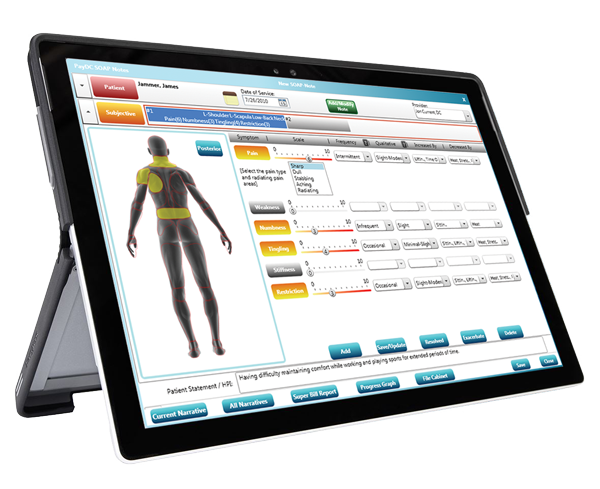 PayDC Chiropractic Software is a cloud-based, EHR-certified and fully integrated platform. Secure access anywhere. Automatic updates. Affordable fees (starting at $149/month). And, you'll never have to purchase an expensive server or incur annual maintenance fees ever again. PayDC makes it easy to manage patient care, stay compliant and be more profitable. Modules for documentation, scheduling, integrated billing, payment planning & processing, Meaningful Use, and more. Contact us for FREE DEMO. PayDC Chiropractic Software Reviews Recently Reviewed! I am the Physical Therapist and have been running multidiscipline practice from approx 2 years. I switched from Web Pt to Pay Dc. To be honest It was the best decision I have ever made. The software is easy to learn. Document is very effective and saves lots of time in claim generation and submitting to insurance company. The software is very customizable and every provider can make their own flow of documentation which is very easy to create care plan and SOAP notes. The best thing I like is it is very compliance and you can run various practice analysis report in seconds which as a private practice owner we want to do all the time to see how effective the practice is. The don't charge you unnecessary for extra admin provider and always work with you to help your practice more efficient. I understand technical support was not great but lately it is very effective. David Klien is one of the best person I ever met who knows what he is doing and talking about. He is always available to help you with any issues you have with software and he also involve personally for any audits you have to help you out. He is not only co founder of it but also compliance office and knows more than any software company about billing and coding. He always speaks in conferences and APTA NJ group how to become more compliance. The software also has reminder appointment to go as well they are working on developing to send text messages too,. .. In short If you want to be more efficient in private practice not matter you are DC, PT or Acu I would strongly suggest this software. I would give 10/10. Thanks for the kind words, Sunny! Pros: The accounting features and the ease of claim submission. Cons: The inability to generate patient lists based on criteria such as insurance carrier or self-pay status without having to export to Excel. Overall: I am very pleased with the ease of use of this product. I like the accounting features in regard to posting and balancing of patient ledgers. The only recommendation that I have is in regard to reporting. There are reports that can produce a patient list by carrier, service dates or demographic criteria. The product allows you to export a patient list to excel but you cannot set parameters and sorting has to be done on the excel spreadsheet. Way to many steps for something that should be a click and generate option. Otherwise, very happy with this product. Customer Service and Tech Support are TOP NOTCH!!! Always a quick response, even if the issue can not be resolved immediately. Cons: Don't find any yet but only thing I feel it it doesn't work on Mac but you can still have parallel and have it on. Recommendations to other buyers: I am the Physical Therapist and have been running multidiscipline practice from approx 2 years. I switched from Web Pt to Pay Dc. To be honest It was the best decision I have ever made. The software is easy to learn. Document is very effective and saves lots of time in claim generation and submitting to insurance company. The software is very customizable and every provider can make their own flow of documentation which is very easy to create care plan and SOAP notes. The best thing I like is it is very compliance and you can run various practice analysis report in seconds which as a private practice owner we want to do all the time to see how effective the practice is. The don't charge you unnecessary for extra admin provider and always work with you to help your practice more efficient. I understand technical support was not great but lately it is very effective. Co founder is one of the best person I ever met who knows what he is doing and talking about. He is always available to help you with any issues you have with software and he also involve personally for any audits you have to help you out. He is not only co founder of it but also compliance office and knows more than any software company about billing and coding. He always speaks in conferences and APTA NJ group how to become more compliance. The software also has reminder appointment to go as well they are working on developing to send text messages too,. .. In short If you want to be more efficient in private practice not matter you are DC, PT or Acu I would strongly suggest this software. I would give 10/10. Pros: Ease of use and accuracy of documentation options. Overall: In the current insurance environment of pre and post-payment audits, it is imperative that each practitioner protects themselves with bulletproof documentation and record keeping. This program is the answer to that challenge and I have to say that having an authority as the key developer of the software is like having a star quarterback on your team. The ease of use, thoroughness of documentation detail, and excellent and friendly customer support have made my experience with PayDC extremely positive and has brought back the joy and confidence in my practice that was threatened by today's insurance and medicolegal requirements and penalties. This lets you go back to focusing on treating and healing patients instead of worrying about your notes. I highly recommend this program to every DC . Comments: Software works fantastic for back office, creating claims to submit to insurance and . The rest of PayDC is functional but not efficient. Very fragmented and information does not feed other platforms to populate useful information and basic reports to track patients and financials. Meaning multiple re-entry of the same basic information and filling out insurance info does nothing to provide the patient with a estimate of cost for treatment. We have to use excel for all financials and estimate of benefits for the patient. CLICK yourself crazy trying to use this for practice management software. We also have to use a third party to provide a financial status report to track where we are to date , monthly, annually. When PayDC goes down it's usually after 5 EST and you can't get anyone to return calls or email. Need another software to manage to business side of your practice. At PayDC, we are consistently upgrading our cloud technology platform to provide the most robust and reliable system performance. In addition, we are regularly enhancing our software application by responding to the direct suggestions of our users. 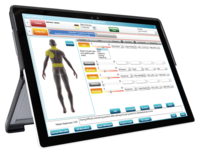 Our EHR-certified software is fully integrated and highly customizable to meet the needs of different practices with appropriate user training. Our brand new, industry-leading D2P (¿Direct-To-Payer¿) billing platform puts your practice virtually online with payers so that you will be able to know the exact status of your claim at any point in time. This saves you time and money, reduces preventable errors, and and will increase the profitability of your practice. Our Customer Service team is available to meet our clients¿ needs Monday ¿Friday from 9am ¿ 6pm EST. Pros: Product was excellent in helping me stay compliant with my notes. Many tutorials offered in the subject compliance and after a Blue Cross Blue Shield audit was happy not to have to pay a dime back. Cons: It is very difficult to make any changes to the care plan template. I also found that occasionally only a small portion plan templates were available. I had not used the billing service because the office outline clearinghouse with the option of free was a better choice. Pros: I love that PayDC is user friendly. They have a very knowledgeable staff that is there to help guide you and point you in the right direction. I love their FREE TRAINING and FREE WEBINARS, too! Cons: I dislike Updating during business hours. Although its not frequent and happens for a short period of time it slows the use of the program. Overall: Ease of use, easy to teach - the information is at your finger tips. Pros: I've used PayDC since my 1st day in practice 7 years ago. They consistently improve on an already great product. It is fairly priced and support is always there for any issue or help navigating the system. Cons: I would love to have compatibility with Macs and iPads but that is really the only picky thing I could suggest. Pros: I have been a client of PayDC since November 2011. 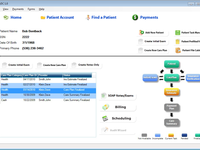 I was very nervous to move into the EHR realm, but this software and this company made it easy. I was well-trained by the staff, and when I did the switch, it was seamless. I got great support and have not looked back. The company is very responsive to suggestions, as I have seen several things added after taking the time to give feedback. It literally takes me less than a minute to update a patient's record on a regular visit, yet I am in compliance, have a professional record of the visit, and have the appropriate codes ready to be filed. Everything is able to be personalized, and once the templates are completed, the notes reflect your thoughts and are done in your style. With this software being cloud-based, there is no expensive, upfront cost or monthly storage fees. It is affordable and simple, and it covers all the necessary bases for a great note. I highly recommend you give it a chance before spending major dollars on some of the other products in the market. PayDC does the job and more. Cons: No complaints with this company. I have been satisfied. Recommendations to other buyers: Try it before you spend money elsewhere. You need to give it a serious look. Pros: Cloud Based, Appointment Reminders, easy to do SOAP Notes and Care Plans. Also billing and running reports are easy to do. Cons: Would like some software changes to make things easier. Such as if we have an event, like sending out the text message reminders, can we send event reminders. Pros: As a very busy chiropractor, this system really simplifies and streamlines my practice. Daily notes and exams are entered easily without spending hours to do so. Having the billing together with the notes really brings it all together, which is how it should be. Everything is easy to learn because it all makes sense and all works together, right at your fingertips. Because it's cloud based it's easy to access from many computers without having to download tons of software and it gives me peace of mind that even if one of my computers goes down I won't lose all my patient data. Cons: I've been using it for a year and a half and have nothing bad to say about it. Minor issues are corrected immediately by the support team who are always very helpful. Recommendations to other buyers: Compare this to other systems and you'll see the difference. It is the best Software product on the market for what I need! Pros: I have used quite a few different practice software but, this is the one I choose to stay with for many reasons. Ease, speed, accuracy, content and the best support. The system is easy to personalize for your practice needs and future changes that may come about. The transition to the ICD-10 was a breeze. I know Docs that are still striving to get this done. My office was ready from DAY ONE! This in itself was worth every penny! Cons: The first time you set up a patient in the system it takes a little time! But this system is still quicker than the rest! Recommendations to other buyers: Be honest and try to be as accurate as you can be with what you are evaluating! Pros: The price for what you get is great! It is an all-in-one cloud-based service. I like how the scheduling system, EMR, and billing are all integrated. As I check a patient in, the doctor sees it and can generate a note quickly (using the last visit's info as a starting point, so there is very little to change before completing that day's visit), and once the note is created, it creates a corresponding claim. This eliminates multiple entries of the same information. Cons: It's great that the billing side of the software integrates with the schedule & EMR, but that's where it stops. There are too many screens to find information. I can't see payments easily on the same screen as claims, and the statements leave a lot to be desired. The care plan generator is great if your care plans are really straightforward, but if you like to have different phases of care (3x a week, 2x a week, etc), then it makes it a bit more difficult, especially when it comes to re-examinations and re-x-rays. Recommendations to other buyers: If you are a non-par doctor that bills insurance for your patients beware! PayDC really works best with in-network docs. Billing can be a nightmare! Pros: The software is handy to our office in lots of ways. It is easy to use and has great features. Our billing and patient accounts are easy to access and the balances are easy to read. Cons: When a patient buys a product we sale the majority of them buy more then 1. its a hassle to add that each time. If it had a number and you could select that quantity that would be helpful and more time efficient. Overall: My experience has been great! Rep helps me with any questions I have and if he doesn't know the answer he will figure it out. He always calls/emails me back with a timely response and has been overall the best Customer Service representative from PAY DC. Our clinic greatly appreciates Rep and his service he provides to us. Your EMR & Billing Solution! Pros: Notes made easy! If you are looking for an excellent way to do your notes and billing you have found it. I have used PayDC for a few years and have found it to be user friendly and take away the stress of note taking. The staff is very helpful and good at addressing any issues you may have. The owner of the company is very involved and wants you to have only the best experience possible. I highly recommend PayDC! Cons: That I didn't get it sooner! Call and try out the free trial! Recommendations to other buyers: Experience the free demo and you will see for yourself. Product provides excellent documentation. Fairly easy to navigate. Pros: Product provides excellent documentation. Fairly easy to navigate - but I'm sure would be easier for those more tech savvy. Overall very happy with the program and the PayDC company. Customer service is second to none. Cons: Love the fact it is a cloud based program. Can access from anywhere. Also no need to upgrade with software. Updates are done regular. Only downside - some recommendations for improvement are slowly implemented. Recommendations to other buyers: This may not be the most advertised program in Chiropractic, but is one of the best. Do a trial/demo and see for yourself! Comments: Of the systems I have used and worked with this is definitely towards the top, but make no mistake... there are some issues. 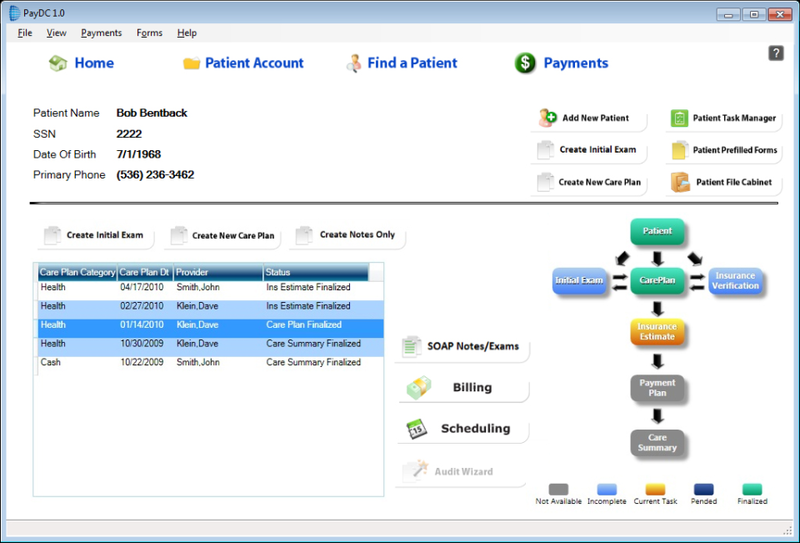 Pros: It becomes apparent quickly this software is focused on billing and coding and not on patient interface. For those are are okay with that, then this is a really good software for the price. I am always partial to cloud based and the fact that your fee comes with clearinghouse and scrubbing technology. I do like a lot of the back office features. Cons: I really feel like the front desk and the EHR portions of the system are "par for the course". I wouldn't say they are better than any of the other software out there, but there is customization ability and that helps. It takes awhile to get everything set up (too long) and then it is click heavy to utilize. Cons: Customer support is a bit slow getting back to you. Overall: Overall, a very good program! Easy to use on the clinical and billing side! Also, very easy to generate quality IR's for PI cases when the patient fills the PW out online. One of the most knowledgeable coding guys in the country designed it! Comments: If you run a specialized clinic you'll be a little underwhelmed. If you're a standard visit chiropractor that uses one (maybe) two basic techniques you'll love it. Pros: This is an easy to set-up and use software because it has all of the basics built in very simply. The interface is pleasing to the eye and simple to navigate. It works with touch screen of any kind and isn't slow while doing it. If you a "straight" chiropractor then you'll love this software. Cons: We run a more specialized clinic dealing with a lot of neurologic cases and also some PI. I found the level of diversified/specific documentation was very heavy on the typing and it didn't integrate well. The preset macro functions weren't as good as i thought they would be. Pros: That it is so easy to use and has so many features that are great and make payDC unique and fantastic! Cons: It does seem to crash quite often. Logging us out and not allowing us to sign back in for quite some time which can get frustrating, but we manage to work around it. Recommendations to other buyers: Stick with payDC. It offers a lot of features we could not find elsewhere. Yes, the crashing part may seem a little iffy, but all the other great things about payDC offset that one bad quality. Cons: I would like a littel more practice management features, recall letters, appointment reminders, things like that! Recommendations to other buyers: Software must be cloud, good billing and good notes, PAY DC hits all the above! Cons: If the documentation module is the flagship, you would think it would give a great logically formatted report - it does not. When going through the history of a new patient, typically if you don't select an entry it will not populate in the report. Their fix - "just delete it from the report". Due to the "global timing" it enters the wrong date of service if you enter a charge after 6pm CST. That means you are billing for a service on a date that you are NOT providing it = FRAUD in the eyes of the federal government. When brought to their attention, "the developers are working on it". Really for 6+ months? When you have an issue, you get no support. IT or developers are always working on it. Working, never completed. Recommendations to other buyers: Anything is better than PayDC. Terrible product, terrible support. Pros: Visually this package is clean and easy to navigate. The program is easy to learn and offers customization of daily notes to reflect the way we practice. The system produces clean claims that get us paid and will notified you when a rejected claim and what needs to be fixed. Cons: Our biggest compliant is that it is slow and one dimensional. The system doesn't allow you to operate in several windows at one time. For instance if you are in a patient's account window you cannot access the appointment calendar without closing out of the patient's window first. This doesn't sound like a big deal until but it is when you realize that switching between windows can take up to 15 seconds. If you are an office who is processing more than 25 patients a day you are going to be pulling your hair out trying to complete a note in a timely fashion. On average my staff is loses 30-40 minutes a day just waiting for this program to toggle between a patient's notes and the appointment calendar. This is unfortunate because the soap note is easy to generate and it doesn't read like many "canned" notes other systems produce. Another disappointment has been customer support. We find them slow to respond to questions and concerns and the company's training materials are limited. Recommendations to other buyers: If you are a busy office this software will slow your operation down. Reports are limited and there is little in the way of patient generating reports to assist in patient management and internal marketing. Comments: I have been using a different paperless system for the last 2.5 years that has both billing and an EMR software program. I decided to switch to PayDC because the prior system I was using had a problem with its billing system and I could not trust my ledgers to be accurate. I needed a fresh start. PayDC seemed like a great option, however from the start there were issues. I was told they would have a Kiosk feature just weeks after purchasing the software. It took over 3 months to get the Kiosk feature to us due to development issues. My staff likes the billing portion of PayDC, for the most part, but I am struggling with the EMR portion. I would have kept my existing EMR software, but the PayDC software would not keep the diagnosis codes in the system for us to use only the billing portion and my staff would have had to look up and hand key the diagnosis codes each time a claim was generated. The other issue I have is that once you sign a note, if you find a mistake later, you cannot change the note or fix the mistake. You have to write an "addendum" (whatever that is). The training is scattered and difficult to coordinate/schedule. There does not seem to be a set training schedule or sequence and being on the West Coast, by the time we call we almost always have to leave a message because no one is in the office to help us during our afternoon shifts. All in all, the software does have some high points, but I am disappointed with the money that I have spent for the product and training that I have gotten so far. Comments: I have problems logging into the remoter servers at least twice a week. Last week was 4 of the 5 days. When I am logged in, I receive multiple errors. The one error closes the entire program. I have repeatedly lost entire new patient info and exams. By the time the person is re-entered, I may have spent about 45 minutes on one entry. The money saved for the program does not outweigh the frustration and time spent fixing the problems. The program can not be customized very much and has not made much efforts to fix the problem. I called my representative to help me. She was apathetic, at best. Her responses made me feel like I was bothering her and it isn't her responsibility. I am sorry you have experienced these performance issues and would be happy to work with you to resolve whatever is causing them. Feel free to contact me through the "Contact Us" page on our website https://paydc.com/contact-paydc/ and we will decipher what is happening to cause your difficulties. I noticed you wrote your review on May 31. Please be advised that our hosting service (Microsoft) experienced an issue on May 31 with their Azure cloud services throughout the entire Eastern Region of the United States. This caused our application to be unavailable to users for awhile. This issue was beyond our immediate control. We worked diligently with Microsoft and service was restored as quickly as possible. Thank you. Pros: Not sure there is anything. It works in the sense you can enter a note and process a claim. Cons: Just about everything. It is not intuitive at all. The learning curve to teach others how to use it is very high. There are way too many things you need to memorize and things you need to change for each note. Way too tedious to have to constantly change things for each patient and when you have a high volume practice this can can be annoying and take up a lot of time. There are so many things you can not do with the program and the things it does do, it does not do them well. Im surprised at the high rating it has. They never do updates and when you voice issues you have with their "support" team they are condescending rather than helpful. Recommendations to other buyers: See what else is out there. Yes this will get the job done but over all its horrendous. Pros: The back office portion of this PayDC is remarkable. We almost never have a return claim. It notifies us if there is a rejected claim and it's easy to use when correcting a rejected claim. We usually get a live person on the phone for support, before 5 EST. The schedule viewer is nice and easy to navigate with multiple options when setting up the practice. Cons: It has zero accounting and reports to monitor money. It requires too many clicks to do everything, and is extremely time consuming. Nothing in this product is linked, so you end up entering the same info in multiple places. They have an East coast location and they close before everybody else. It's hard to get customer support after 5 EST. I don't like having to use Excel to manage finance with six spreadsheets. The info is in the system, it's just not programmed to produce a report that could be used to manage money. There is no click and drag option in the appointment scheduler. Recommendations to other buyers: Consider a product that offers a robust front and back office management software. More work with fewer clicks is always recommended. Use a reporting system that offers flexibility to control what populates on each report. Pros: Very easy to use. All new employees have a better understanding of the day in and day out function of the practice. Catches less mistakes and allows to send better claims to insurance companies. Cons: The systems does mend to errors that aren't really errors but actually patient based complaints. Insurance companies dictate what complaints to actually need of treatment. Affordable way to start with chiropractic software, but limited functionality. Pros: We started with this software at the beginning of opening a practice, it was very affordable and worked. Cons: While affordable, it lacks a lot of functionality and can slow office flow down do to its limitations. Comments: Wow....10 thumbs up for Trisa Stonebeck. Trisa has been absolutely wonderful and patient in training two new employees in our office as well as helping to update the doctors. We had unexpected changes occur at the practice and she has been a calming force and educator. I love that she has a firm hand in proper practices. She definitely knows her stuff! Love working with her because she's friendly, punctual and realistic about the overall process. You are lucky to have her on staff. Comments: I am not very computer savvy, so the ease of use of PayDC Chiropractic was very important to me. The layout and design is appealing to the eye, and I feel proud to use in it my office. I was looking for software that would allow me to do my billing, scheduling, and EMR all in one. PayDC provides all of that for me. The customer support from my very first call has been Outstanding!! It meant a lot to me to be able to talk to a person and not a machine, and they have all been extremely patient and helpful. Pros: I like the report generator system and the visual areas to mark complaints. Cons: We are having issues with some of the daily treatment notes missing after saving and signing. We are trying to get these resolved through PayDC's trainers and the billing clearinghouse. Recommendations to other buyers: Make sure you understand the system perfectly and have all the correct provider numbers set up. Pros: The EHR is amazing. It's easy to chart accurately and quickly. Cons: The accounting ledger is not easy to read or understand. It is hard at a glance to see what the patient balance is. Also, the system does not account for an insurance discount in real time. Recommendations to other buyers: Make sure you take a real look at the accounting side of the software. Comments: PayDC's support staff is excellent. They are prompt to reply, professional, and are employees of PayDC in their home office, not outsourced. PayDC's new billing platform, Advanced Provider Solutions is a superb value, that turns a relatively simple Chiropractic EMR into a far more advanced system than many comparable products. Pay DC: Easy to use, easy to follow. Pros: Everything you need is within a click. Cons: Once your note is signed and finalized there is no going back! Not even to correct spelling or date mistakes, so make sure your note is 100% ready or else you wont be able to change it. Recommendations to other buyers: Use the schedule a bit to know if you like how it works. Comments: I simply love using the PayDC Chiropractic Software program. It has made me more efficient and has streamlined every aspect of my practice. Without really trying, my office is almost paperless, which is something that I never thought possible. I would recommend this software program to any chiropractor that is thinking about making a switch. Definitely schedule a demo to see for yourself. Comments: We are supremely impressed with PayDC. Everyone we have talked to has been extremely pleasant, professional, and prompt. The ease of use has been seamless, especially due to the training. I really feel that it will increase our collections and patient volume. Thank you for the kind words, Dr. Darby! Pros: Fairly easy to learn and use. Has all the information you need for EHR. Cons: Customer service is not always the best. We have had times where we have emailed and not received any word back for over seven days. Recommendations to other buyers: Make sure that the software pertains to all your needs. Cons: It isn't as detailed in the exams or the notes as it could be. Recommendations to other buyers: Look as closely as you can at the notes, how you write them, and what diagnostic info you'd like to show, and see if it matches. Comments: so grateful for all customer service agents - they have always been super helpful and they never stop until the job is done or the issue resolved! Pros: We originally liked that the price was low and that there was no contract. Cons: We have experienced absolutely nothing but problems with PayDC, and the worst part was that nobody seemed to care about our terrible experiences. Recommendations to other buyers: My advice is to find a different system. Pros: There's not much that I like about PayDC. Cons: This program lacks organization; there are several windows that need to be opened in order to get specific patient information. Recommendations to other buyers: I would highly recommend using another chiropractic software program. Too many problems to justify the price. Pros: It has a clean look. Cons: There are so many glitches that they could not begin to help us with. Appointments and payments were randomly deleted from the system. Recommendations to other buyers: Look at another system with less problems and better customer support.